I am no baker. I never was crafty. Mother, a staunch feminist, insisted we didn’t have to learn to sew and knit. Until my all-girl school in Kolkata saw sense in teaching us carpentry and light metal work too. Never mind International Women’s Day. In the meantime, I grew older happily embracing the tadka pan but quietly rejecting the notion of modern femininity that is, in my humble opinion, the cupcake. The problem is this. I love eating the darn things. They are so pretty. They cost a bomb in the shops, for essentially, a bit of flour, sugar and eggs. I knew I was trapped into a dark hole with only a Wilton 1M and a muffin tray for company when Mini Basu, aged nearly four, requested cupcakes at one of our weekly cookery sessions. No matter. I have done worse in the name of motherhood. I snooped around my favourite baking blogs by Deeba and Jules. I just needed a moment to launch into action. The office Valentine’s Day Bake Off was it. With divisions pitted against each other, the stakes were high and someone found a photo of me stirring a curry online. I was soon labelled the “professional” in their midst. I frogmarched the team to the local supermarket to source supplies. Co-ordinated the team entry assigning tasks all round. Then came home, drank half a bottle of wine and merrily baked a batch of by far the most deeply unattractive cupcake-muffin hybrids I have ever seen. We were commended for taste. I should have taken a stash of Handvo with me instead. 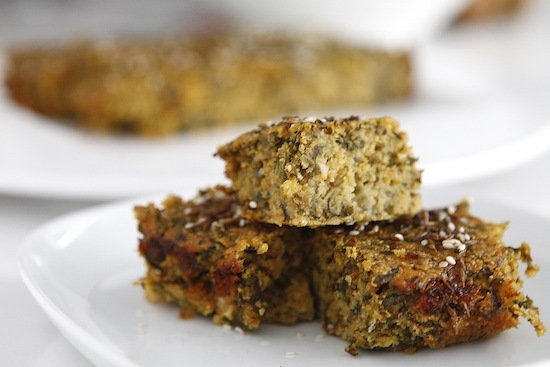 This Handvo recipe is for a spicy, savoury lentil cake from Gujarat, baked in a hot oven, that makes a healthy and very moreish snack. Nanny K kept bringing me boxes full and I got her to share the recipe with me. The only trick part to this is sourcing Ondhwa flour (also Handvo flour), which is a powdered lentil and rice flour, readily available in ethnic stores. It took just the first go to get it right, and the results were reassuring. They disappeared nearly as quickly as a batch of cupcakes. Next stop: oven baked dhokla. And if that goes well, I’ll try my hand at a Black Forest Gateau. Or something. Mix all the batter ingredients together in a large bowl, bar the oil. Leave this to sit for about three hours. When the time is up, turn the oven to 200C (400F, gas mark 6) to preheat. Rub the oil all over a square oven proof dish. Then pour the batter in and bake in the hot oven for 30-40 minutes until the top is golden brown and crusty. Take the dish out of the oven and leave to cool, while you make the tadka. In a small pan, bring the oil to heat on high then add, in quick succession, the hing, cumin and mustard seeds, red chillies and finally the sesame seeds. take off the heat and carefully drizzle it over the handvo. When the dish is cool enough to handle, cut into squares and enjoy hot or cold, but definitely with a nice cuppa. The handvo looks amazing by the way 🙂 And cheers to the Black Forest Gateau!!! Hi Mallika, this looks very interesting. But i am not sure if its available where i stay (chennai,india). Do you know how the composition of the ondhwa flour (thought of making it at home if its not available in the stores)? Have never mastered baking..nor do I have the interest but but but if one such half hearted trial succeeds….I get all boosted up!! and then this recipe continues forever till man of the house says, “enough”. one such recipe below. Ondhwa flour? What is that, I don’t really get it. Is that same like wheat flour? my beloved makes Handvo for me often, i’m the cook in the house but she has a certain touch which I don’t have. Great comfort food, yes indeed must have chai with it.